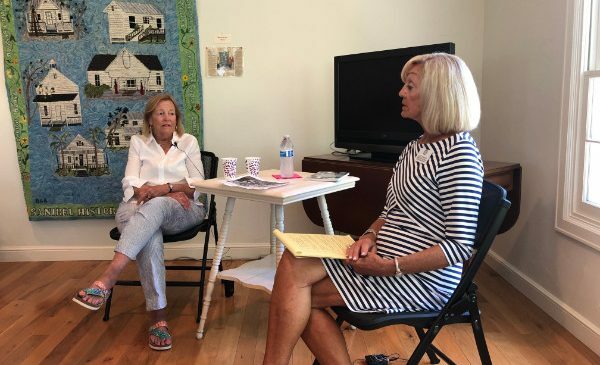 April 3, 2019 – Mariel Goss recently spoke to the Sanibel Historical Village volunteers about the history of the shared-use path, also referred to as the bike path. Goss first came to Sanibel on vacation in 1966. The family moved to Sanibel from London in the early 1970s with four small children – just in time for the beginnings of the home rule efforts to form a city. Her husband, Porter Goss, started the Island Reporter newspaper, which kept islanders informed about the benefits of incorporation. Island incorporation could not have happened at that time without the Island Reporter, Mariel said. During this time in the 1970s, Periwinkle Way was heavily traveled with cars and big trucks, such as dump trucks and cement mixers, many exceeding the speed limit. A lot of construction was happening on Sanibel due to the first causeway that opened in 1963. Cars and trucks did not respect the bicyclists on the road, according to Mariel. “It’s important to note that at this time, Sanibel was governed by Lee County. It was not a city until 1974, so Sanibel was not able to control development or regulations on Sanibel,” Mariel said. In addition to growing concerns about bicycling and walking on Periwinkle Way with the increasing traffic, houses were far apart on the island, and Mariel and other mothers wanted a safer way for their children to travel to see friends across the island and a safer way for bicyclists to get to Bailey’s Store from the east end. Eventually, a group of women met at The Community House to discuss these problems and to solve them. Mariel’s friends from Washington, D.C. had told her about a bike path from Mt. Vernon into D.C. that had just been created, and she felt the same could be done on Sanibel. The group approached local and state government officials who had never heard of such an idea as a bike path next to the road. “They were not receptive to the idea and told the group it would take money to build a path and there was no money for such a purpose,” Mariel said. That’s when the group decided to raise money in other ways. They created and sold a Sanibel telephone book – which someone had to type, pulling names one by one from the Lee County directory. The books sold for about $2 each. Mason jars were put in various stores to collect money. Their slogan was “Give us your feet,” referring to the fundraising goal of raising $2 for each “foot” of paved bike path. They sold T-shirts. They organized a bike rodeo. All of these efforts netted $53,000. The biggest publicity the group received was when they organized a “Bike-In,” analogous to a “Sit-In” where islanders on bicycles blocked the right-hand lane of Periwinkle Way from the Periwinkle Park campground to Bailey’s General Store. The biggest breakthrough in the fight for a bike path happened when Sanibel became a city and could govern itself and do its own city planning. Porter Goss was elected the first mayor of the new city of Sanibel. The new Sanibel government supported the idea of a bike path. They accepted the $53,000 the group raised and set aside more money to build a path from the causeway to Bailey’s General Store. Mariel does not recall there being any resistance to the bike path from islanders. In fact, islanders actually volunteered to help clear the trees along Periwinkle Way so the path could be paved. She recalled having some trepidation about talking to homeowners whose Australian Pines would have to be cut down – especially Clarence Rutland, who gave his consent. Finally, Mariel recalls some type of bike parade in recognition of the new bike path during the Bicentennial Celebration on July 4, 1976.